Palestinian amora of the fourth century; a contemporary of Jacob ben Zabdai and Ḥelbo, together with both of whom he was called upon to decide a question of religious law (Yer. Niddah 50a). When asked whether the law of Demai applied to the Syrian leek, he was unable to decide the question by himself, and had to seek the advice of R. Jose (Yer. Dem. 22d); and on another occasion, when a question relating to the divorce law was addressed to him, he had to refer it to Eleazar (Yer. Ḳid. 63c). A tradition handed down from the above-mentioned Eleazar was differently transmitted by the amoraim Jonah and Jose (Yer. Sheb. 33d). In the Babylonian Talmud (Pes. 113b) Yiẓḥaḳ has been identified with five other amoraim of similar name, but this has been refuted by Bacher, who disproved also the allegation of S. Krauss that the names and are identical. 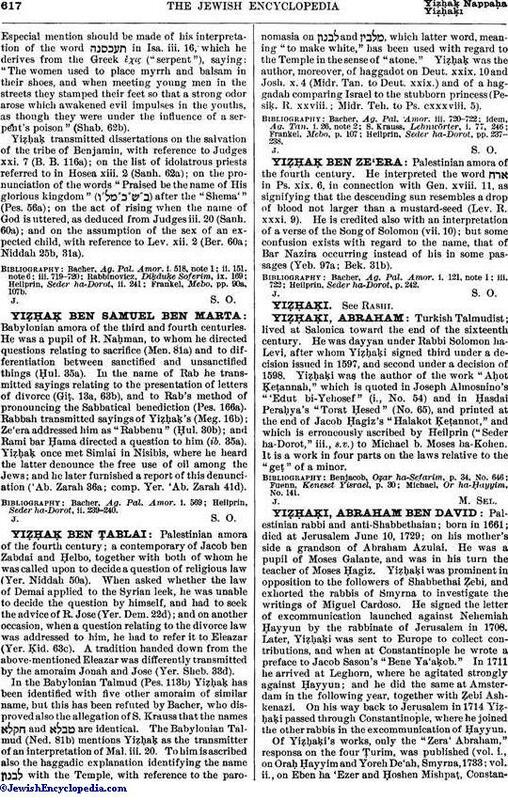 The Babylonian Talmud (Ned. 81b) mentions Yiẓḥaḳ as the transmitter of an interpretation of Mal. iii. 20. To him is ascribed also the haggadic explanation identifying the name with the Temple, with reference to the paronomasia on and , which latter word, meaning "to make white," has been used with regard to the Temple in the sense of "atone." Yiẓḥaḳ was the author, moreover, of haggadot on Deut. xxix. 10 and Josh. x. 4 (Midr. Tan. to Deut. xxix.) and of a haggadah comparing Israel to the stubborn princess (Pesiḳ. R. xxviii. ; Midr. Teh. to Ps. cxxxviii. 5). Heilprin, Seder ha-Dorot, pp. 237-238.